HERALD WAR REPORT: News, notices and adverts from the Morpeth Herald, May 12, 1916. 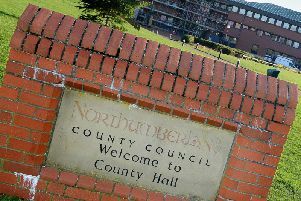 A successful meeting, under the auspices of the Northumberland War Agricultural Work Committee, was held in the Town Hall, Morpeth, on Wednesday afternoon. There was a very gratifying attendance of those interested in the scheme. Mrs Straker, of Hexham, who presided, was supported by the Mayor (Ald. Ed. Norman), Professor Gilchrist, and Mr Mayhew. Mrs Straker, in an interesting speech, explained the objects and the methods that were being employed to carry out the county scheme. She said that they did not realise the importance of agriculture before the war. Only seven per cent of the population was employed in agriculture, but since the war that number had been greatly increased. Owing to the scarcity of male labour the only solution was the employment of women. Their effort was to make this country more self-supporting. Professor Gilchrist said that the county organisation had two objects in view. They had to increase the output of farms and gardens in every possible way and organise women and other available labour to the fullest possible extent. He pointed out that they had to do their best to increase the supply of milk, and added that milking could be done far better and cleverer by women than men. The war had brought home to the people the value of small gardens to the household. In Carlisle there were 300 allotment holders, who had cultivated what was wasteland, and got excellent returns. The same thing was taking place in Newcastle. He mentioned that women had always done good work on Northumberland farms. One million persons were engaged in agriculture in England and Wales — one in 11 being women. In Northumberland, however, there were rather more — one woman to 4 men. The great point about agricultural work was to be willing and enthusiastic. There were no eight hours day, but the work was interesting. Mr Mayhew remarked that it was no innovation for women to work in gardens, because most of the work on their commercial gardens was done by women. He could speak as to the excellent work that was being done by them, and he expressed hopes that the efforts of the County Committee would be attended with success. The Mayor said that they did not want to see the land out of cultivation, and it was for them to consider the best means for replacing the labour which they had had to surrender for the Army. There were experienced women workers, who were willing to go, but they had their family cares at home. If they could provide for taking care of the children, while the mothers were at work, they would be doing a useful work. He also referred to the good work that women were doing in the market garden industry, and said that a market gardener remarked to him the other day that a girl had only been two or three days at the work, and he had been surprised at what she had been able to accomplish. During the meeting seventeen women and girls were enlisted by Miss McDowall, the local organising secretary of the scheme. The war continues to rage, and its effects are being more and more felt daily. This is generally true, and our country has given many of its brave sons in the defence of justice and righteousness; and our town has contributed to our country’s cause not a little of noble service and life. This must also have been the thought of the Rev. J. Miller of the Congregational Church, on Sunday morning last, when he referred to the death of Second-Lieut. N.A. Swinney on the battlefield. Mr Miller said:— ”About nine months ago we were scarcely aware of the war, but as time has elapsed the fact has been severely brought home to us. We, as a church, have suffered heavily. We have lost three fine young men, not to speak of those who have been wounded. The third of these, Mr Norman Swinney, was killed in action on April 28th. “On Tuesday last when the sad news reached us it spread quickly, as was natural, for he was greatly beloved by all who knew him. Indeed, several have spoken to me with tears in their eyes, who thought of him as in some way their own. It is a great blow to us, for although he was so young, he was an honoured and useful member of our Congregation, having acted as organist and Sunday School teacher and rendered whatever service he could in any other capacity. But those who feel the loss most are the parents of our brother and friend, Mr and Mrs James Swinney, and the other members of the family, and my reference to this death on the field is intended to be an expression of our heartfelt sympathy with those whose grief is so great today. “It will be gratifying to you to learn, if you do not already know, that Mr and Mrs Swinney are bearing up wonderfully. However, this must not be received lightly. They are sorely stricken, but here is the secret of their strength; their sacrifice has been complete, and they have the consciousness of its acceptance with God. The gift of their son was for them the right thing, and they know that he is with God. Every memory of Norman is of the happiest kind, but their sorrow is great. Let us make it our own and thus share it with them. “Mr Swinney’s letters from the Front were of the most cheery nature, yet we sometimes felt that there was a sense of gravity in them. His work was a mission to him — a call from God, and we have the finest testimony to his character and service from his comrades on the field. “Let me quote one or two extracts from several letters:— ‘I cannot quite realise that Norman is dead, although I went to see his grave last night. I was too late to see him buried, but went to pay my last respects to a true comrade and brave friend. Oh, what a loss he is! The whole battalion mourns him from the Colonel down to the privates. The poor lad has a beautiful burial ground, as pretty picture as one could wish, in “Happy Valley,” as it is called, just behind the firing line. He died like a hero. ‘How can man die better?’ ‘He died saving his men.’ So far the letters. The King and Queen deeply regret the loss you and the Army have sustained in the death of your son in the service of his country. Their Majesties truly sympathise with you in your sorrow. Dear Mrs Swinney,— On behalf of all ranks of this Company, I offer you our very deepest and heartfelt sympathy in your great loss. He was loved by everyone in the battalion who knew him; his own men worshipped him. A Sergeant was killed because he refused to leave the spot where poor Norman was lying. Our own Mess will never be the same without him. He was just the ideal officer. His last words, just as the shell which killed him was seen in the air, were: “My men to the left.” The men obliged and only two were hit. I think Norman remained where he stood and was caught, splendid boy that he was. “Dear Mr and Mrs Moir,— It is my sad and most painful duty to have to inform you that your son, Private Jas. Moir, was killed in action last night. His death, which was caused by the bursting of a shell, by which four other men were also wounded, was instantaneous and apparently painless, and his mortal remains have been laid to rest in a burying ground not far from the place where he gave up his life. “It is not easy for me to give you words of consolation in your loss, but I do assure you that you and your family have my deepest and most sincere sympathy in the sad, and yet heroic, death of one who had endeared himself to all with whom he came in contact by his quiet, unassuming, and gentlemanly demeanour, He was an excellent solider, bearing all the privations and discomforts, which are inseparable from active service, with cheerfulness and courage, and he was also an excellent example to his comrades. “I trust that, as time goes by, you will feel better able to bear your sad loss, and will come to recognise that he has died a hero’s death, yielding up his life freely and willingly that the great cause for which we are fighting — the freedom of the world from Prussianism — may prevail. He will not be forgotten by him comrades here, of whom many join with me in these words of sympathy. At the quarterly meeting of the County Council, last Thursday, Ald. Bell, in presenting the report of the Education Committee, said there were in the county, excluding the secondary schools, 389 male teachers. Of this number 158 were over military age, 106 were serving, and 77 had attested. Eight female teachers were serving as nurses. There had been five casualties among the male teachers. Sale of flags, £49 8s. 6d. ; sale of work, £30 1s. 6d. ; making a total of £79 10s., a cheque for which has been handed to his Worship the Mayor to be forwarded to the secretary of the above. Mrs Chris. Taylor wishes to take this opportunity of thanking all the enthusiastic workers who collected such a handsome amount by the sale of flags, also the kind friends who sent contributions in money and kind towards the sale of work, and Mrs Murphy for her benefit night so freely given. To Councillor R. Swinney her best thanks are due for his very able assistance in carrying out the whole of the arrangements, which contributed greatly in making the effort such a pleasing success, and finally she desires to thank the Mayor, also Councillor Elliott, and the inhabitants of Morpeth for their kind patronage. MOIR.— Killed in action (France), April 13th, 1916, Private James Moir, 1467 (Northumberlands), Chevington Drift. — Our loving brother marched away. He fought among the brave; Somewhere in France he nobly fell and fills a soldier’s grave. In manhood’s pride he fought and died; We did not see him fall. But one thing sure we know he did — Answered his country’s call.— Ever remembered by his loving brother and sister-in-law, Will and Aggie and family. MOIR.— Killed in action, April 13th, 1916, Private James Moir, N.F., First Line, beloved son of James and Annie Moir, 5 Linhope Terrace, East Chevington Drift, late of Ashington. The face I loved is now laid low, The fond true heart is still, The hand I clasped when saying good-bye, Lies low in death’s cold chill.— Ever remembered by his father and mother, brothers and sisters, and sister-in-law. ROUTLEDGE.— Accidentally drowned in France on April 22nd, aged 32 years, Pte. Thomas Routledge, Yorks Regiment, beloved son of Robert Routledge, of Routledge’s Buildings, Bedlington.— Ever remembered by his father and sister. STEPHENSON.— Killed in action, April 28th, 1916, Private W.R. Stephenson, N.F., aged 34, youngest and beloved son of the late James and Catherine Stephenson, late of Claremont Villa, Newbiggin-by-the-Sea,.— Mourned by all. Mr and Mrs G. Horner, 18 Plantation Row, Dinnington, have just been notified that their son, Private R.W. Horner, N.F., has been killed in France. This week has brought us the long looked-for bright genial weather. The protracted damp, cold weather which has made a backerly spring has given place to bright, health-giving sunshine, and on every side is to be seen the outburst into verdure and beauty of nature, which excites exhilarating feelings, that nature, long dead and cold, brightens and smiles on the world again. Not the least joy-giving thought is that our brave lads in France have no longer to endure the severity of the weather in the trenches, and in the letters we are receiving grateful mention of this is not forgotten; and the batches of young soldiers who are constantly leaving us indicates from the jocund, hopeful spirit which they display, that the genial weather is not without its influence upon them also. By kind permission of the committee of the Soldiers’ Institute, a grand concert was held at Morpeth in aid of Nurse Cavell’s Memorial on Thursday afternoon, at which there was a large and fashionable audience. The chair was occupied by the Mayor (Ald. Ed. Norman), who delivered an appropriate address. The concert was opened by a pianoforte solo by Miss E. Wood, which was greatly appreciated, and was followed by:— Chorus, “The Ghost of the Violin;” song, “The Land of the Long Ago,” Miss E. Osborne; song, “Good-bye, Virginia,” Pte. L. Williams; song and Scotch dances, Miss L Wood; song, “Until,” Pte. T. Stubbs; song, Miss Redhead; song, “The Preacher and the Bear,” Pte, A. Morris; recitation, “Cheering up an Invalid,” Miss H. McKenzie; song, “It’s a Lie,” Pte. J. Elliott; song, Pte. C. Trickett; dance, (skipping rope), Miss L. Wood; conjuring, Sergt. O. Roberts; chorus, “Nobody;” song, “A Little Bit of Heaven,” Miss E. Osborne; song, “Wot fur so ee luv oy?” Pte. A. Morris; song, Miss Redhead; song, Sergt. O. Roberts; song and horn pipe, Miss L. Wood; song, “Because,” Pte. T. Stubbs; recitation, “The Rehearsal,” Miss H. McKenzie; duet, “The Boy who Stuttered and the Girl who Lisped,” Miss E. Wood and Pte. A. Morris; song, “What you’ve never had you never miss,” Pte. Williams; song, “Vot a game it is,” Pte. J. Elliott; song, Pte. C. Trickett; “God Save the King.” Miss E. Wood skilfully acted as accompanist during the afternoon. The hall was suitably decorated by Mr T.B. Waters, secretary of the Institute. Mrs Wood wishes to thank the committee for granting the use of the Institute; Mr T.B. Waters, secretary, for his assistance; the artistes for kindly giving their services; the Mayor (Ald. E. Norman) for the plants; and Mr T.J. Smith for the screens and curtains. The annual meeting of the Morpeth Rural Council was held on Wednesday. The Hon. and Rev. W.C. Ellis presided. The Surveyor reported that a thorough inspection of the scavenging in the townships of Widdrington and West Chevington was made on the termination of the Widdrington contract and the result reported to Mr Sample. He had also written to the Widdrington Coal Company with regard to the scavenging of their own houses. He had received a letter stating that they could not undertake the work owing to shortage of labour.— The Surveyor was instructed to get what men he could to do the scavenging. The Surveyor presented a quotation from the Sanitas Co., for the supply of disinfectants, which he usually ordered, but as the increased cost was so much — the difference between £5 16s. last supply and £14 8s. present quotation — he asked for instruction on the matter.— It was agreed to accept the quotation. There was not a deal of interest at the annual meeting of the Northumberland Aged Mineworkers’ Homes Association at Newcastle on Saturday last. A gratifying feature was that the income had increased by over £300 for the year despite the strenuous times. It was decided there should be no more homes built at present owing to the enhanced cost of material and labour.